We have two new Review Board releases for you today! See the 2.5.17 and 3.0.1 release notes for the full list of changes. If you're upgrading to 2.5.17, please follow the installation instructions in the release notes so you don't end up on 3.0.1. It's here! Review Board 3.0 is here! It feels like yesterday that we wrapped up the first release of Review Board 2.5. Surprisingly, it's actually been 2 years, and we've been busy in that time building the next major evolution of Review Board, 3.0. That version is here, and with it comes new integrations for third-party services, automated code review support, new review capabilities, better discussions, and oh so much more. It's a big release. Let's take a look at the major features. Project/task management services (Asana and Trello, also coming soon). You can create as many integration configurations as you need, directing updates for different teams to different Slack channels, or using different tools for different repositories. More integrations are coming soon, and extension authors can build their own. Your reviews can contain general comments, which aren't tied to any particular file, and are useful for pointing out higher-level issues with a change (missing screenshots, typos in the description, architectural problems, or anything else). We're introducing optional issue verification, which ensures an issue can't be resolved and the change landed until the reviewer has verified the fix. Filed a Ship It! accidentally, or maybe it no longer applies? You can now revoke your Ship It! at any time. Add some flavor to your comments with Emoji shortcodes. These work on any database (unlike Unicode Emojis), and are largely compatible with Slack and GitHub's Emoji sets. To share a mockup, meme, or other images in your comments, you can drag-and-drop images into text fields. This works with any Markdown-capable text field in the product. Need to hand off a review request to another developer? Owners of a review request (and administrators) can now re-assign ownership of a review request. New discussions or updates are highlighted in blue, letting you see what's new since you last looked at the page. If you've already seen everything interested in a review or an update, the box will be collapsed by default, letting you focus on what's most important. Want to share part of a discussion in chat or in an e-mail? You can easily link to reviews, review request updates, and individual comments through the link icon on the side. Custom avatar backends for using your company's existing photo database instead of Gravatar.com. New fine-grained control for modifying extra_data in the API, and controlling access to data. A better way of adding customs fields, with built-in options for drop-downs, checkboxes, date fields, and more. Did we mention it's a big release? Whew, that's a lot, and doesn't even cover all the new features in the release. Ready to get going with Review Board 3.0? We recommend installing on a test server first with a copy of your database, just to make sure it works for you. Please let us know how Review Board 3.0 works for you, or what you're most excited about. You can also find us on Reddit at /r/reviewboard. Review Board 3.0 RC 1 is now out! 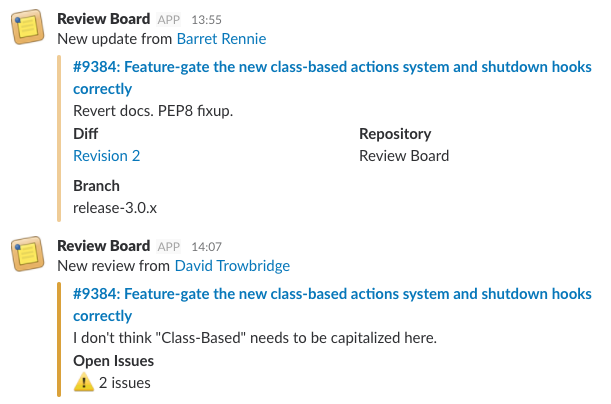 We've just wrapped up what should be the final release candidate for Review Board 3.0. This release polishes up some of the new features and visuals, improves performance throughout the product, enhances the API's capabilities, and fixes a handful of bugs and regressions. One of the major goals of Review Board 3.0 is to help you better follow along with any changes and discussions on review requests. 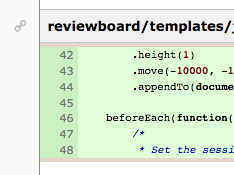 To help with that, we've improved when boxes on the review request page start out collapsed. If there's a new review or update to a review request, a new reply, an issue that needs to be resolved, or pending status updates, the box will be expanded, but if not, it will be collapsed. This really helps to see what's most important when working with large review requests. Most resources in the REST API provide a special field extra_data, which stores arbitrary JSON data that clients can write to and read from. Until now, clients could only store simple keys and values, and couldn't easily work with structured JSON content. The API now supports using JSON Patches and JSON Merge Patches to modify extra_data, allowing for complex JSON structures to be stored, modified, and returned. Screens are getting better all the time. MacBook Pro "Retina" displays arrived in 2012, and even higher-DPI screens have become more common since. Review Board has shipped artwork for "2x" DPI displays for years, but now we support "3x" and higher, with improved loading and no more transitions from low-resolution to high-resolution graphics. No matter what your display, Review Board will be nice and crisp. This release is filled with polish and fixes for performance and stability. See the release notes for the complete list of changes, along with installation instructions. We plan to ship the final 3.0 release this month, based on your feedback from this release. We expect that this will be the final release candidate, and that not much will change for the final 3.0 release, so now's the time to test and send us your feedback. Review Board 3.0 beta 2 is here! There's much more, but let's break these features down. Any updates, reviews, or replies made to a review request since you last looked at the page are now highlighted with a blue dot and a blue border, helping you to quickly catch up on what's new. Ever leave a Ship It and regret it? Maybe you realized you missed something important, or it just doesn't apply to the change anymore. Now you don't have to live with the regret. Clicking the "X" on the Ship It able to confirm you want to revoke it, and away it goes. Open issue tracking is a great way of communicating what changes need to be made before a change can go in, but sometimes an issue is so important that you really need to verify its resolution before it's closed. Now, when filing the issue, you can mark that it needs verification. This will still allow the review request's owner to click Fixed or Dropped, but it won't be closed until you verify their resolution. You're also free to re-open, if you disagree with their change. This also works well as a "Don't Ship It" feature. Simply never verify the issue until both sides are in agreement on the direction the change must take. Text fields with Markdown enabled now accept Emoji shortcodes. These are codes like :smile:, :thumbsup:, etc. that will show up as Emojis. Review Board can now integrate with your CircleCI or Travis CI build systems to perform automated tests when review requests are posted. This is a great way of verifying that code going up for review pass all unit tests, browser-based tests, and anything you have set up. We're still working on the documentation for these, but the Integrations release notes go into the basics. You can find these integrations in the Administration UI -> Integrations page. Lots of new extension functionality for the entries (boxes) on the review request page, better custom field support, and other enhancements. For the entire list of changes, see the Review Board 3.0 beta 2 release notes and Integrations 0.5 beta 2 release notes. Make sure you're deploying on a test server with a copy of your database in case anything goes wrong! You can't downgrade. Now that we're finished with feature development, we'll be focusing on bug fixes and polish. We plan to have one more pre-release (Release Candidate 1) in just a couple weeks, with a final release to follow shortly after. Aiming for early November. Your feedback will be invaluable to ensure we have a high-quality final release. If you're able to try beta 2, and have anything to report, please reach out to us on the community support forum or our bug tracker. We have two new security releases for you today, both fixing security issues reported to us by security researcher Dylan Ayrey. There's also a few bug fixes for GitLab and Subversion, and some improvements for the Administration UI's Security Checklist. We now generate Apache configuration files that add a Content-Disposition: attachment header to all media files, forcing them to download. If you're not using a standard Apache setup, you may need to modify your configuration to add this header. You can visit the Security Checklist to make sure this header is being set. 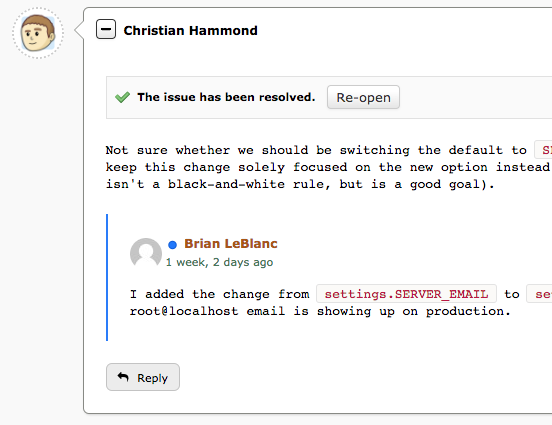 Review Board 2.0.31 and 2.5.16 include fixes for working with changes on GitLab. Both fix issues viewing diffs against files containing Unicode characters, and 2.5.16 includes a fix for creating/modifying repositories for self-hosted GitLab servers. 2.5.16 also includes a fix for the New Review Request page when there are problems talking to Subversion repositories. Errors are now reported, instead of the page reporting a generic "Internal Server Error." See the 2.0.31 and 2.5.16 release notes for more information on these releases, along with upgrade instructions. Today's release of Review Board 2.5.15 is a small bug fix release taking care of a problem that came up in last week's release of 2.5.14, along with fixing an annoyance some users have hit when loading diffs in the diff viewer. In last week's release, we made some changes to the Quick Search field and API for security purposes. One of the changes resulted in a crash that could occur using the API, breaking the Quick Search field in the process. If you were bit by this in 2.5.14, an upgrade should fix this for good. We also fixed a bug in the diff viewer where attempting to switch diff revisions while still loading diffs would result in a crash and a failure to load the new revision. It's a pretty small release. As always, release notes are available. We have two new releases for you today, both fixing a couple of undisclosed security bugs, along with providing other bug fixes and feature enhancements. We discovered an information leak in one of our APIs, allowing a request to be crafted that would reveal some details of review requests otherwise intended to be private. This affects you if you use invite-only review groups or private repositories for access control. Both of these issues have been fixed, and additional unit tests have been added to ensure these never regress. We recommend that everyone upgrade to this release at their earliest convenience. If you locate a security problem in Review Board, please contact security@beanbaginc.com, or file a bug and choosing "Security issue". 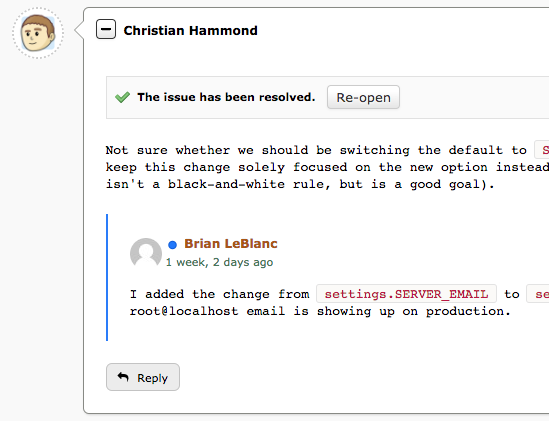 Review Board 2.5.14 introduces support for GitHub-Flavored Markdown tables. You can now provide tabular data in review request descriptions or in comments. If you're running Review Board 2.5.14 and have search enabled, you'll now be able to search for review requests based on their commit ID, which is useful if you're using Git or Bitbucket. This will require a full re-index after upgrade. Keyboard navigation in the diff viewer should no longer get stuck or fail to navigate to file headers. A regression in extension building/packaging when using LessCSS and UglifyJS has been fixed. Failure to load files from a repository when viewing diffs no longer results in huge entries in the log files. Sending test e-mails should now properly report any errors that come up when communicating with the mail server. The styling for buttons on Firefox should now be more consistent. See the 2.0.30 and 2.5.14 release notes for more information on the release, along with upgrade instructions.